"I've never had the chance to do an (independent) research project like the one at Huyck before, so the program was very beneficial to me. I'm even presenting my poster at a local science fair." Wildlife Ecology Research is an intensive 2-week day program where high school students will learn basic ecological principles through hands-on research experience. Ecologists from colleges and universities around the region will instruct students on broad topics in ecology. Wildlife Ecology Research culminates in small group research projects. This program aims to provide a significant academic experience that will help students prepare for courses and research experiences at the college level while letting them explore career options in the natural sciences. Tuition is $475 for Preserve Members and $550 for Non-members. No family should be discouraged from applying to Wildlife Ecology Research because of lack of funds. Tuition assistance for Wildlife Ecology Research Day Program is awarded via merit based scholarships and/or on the basis of financial need. Please contact the Preserve office to inquire. Anne G. Rhoads, Ph.D. Anne is the Director of Conservation and Education at the Huyck Preserve and is trained as a forest ecologist with a special interest in disturbance ecology and the response of forests to human disturbance. She has years of experience in education and land conservation and has two children. Sue Beatty, Ph.D. (see below) Sue is the Senior Research Fellow at the Preserve this year, a post she has held over two previous summers. Sue's decades-long research at the Preserve focuses on disturbance ecology in forests. Sue will lead our undergraduate Odum internship program at the Preserve this summer and looks forward to interacting with the WER students over their research projects. Susan W. Beatty, Ph.D., is recently retired as the Provost of the Sage Colleges. Her interests are in biogeography, soils and plant ecology. She has worked extensively on the effects of both natural and anthropogenic disturbances in temperate forests, California chaparral and grasslands of North America and China. Her research on species richness in deciduous forests of the northeastern U.S. has been supported by the National Science Foundation and her work on the stability of grazed grasslands has been sponsored by the National Academy of Sciences (PRC) and the Nature Conservancy (CA). Currently her interests are in integrating fine and coarse-scale vegetation processes to determine potential response to disturbances such as global climate change. Mary Beth Kolozsvary, Ph.D. Mary Beth Kolozsvary is an Associate Professor of Environmental Studies and Sciences and former Biodiversity Scientist with the New York State Biodiversity Research Institute at the New York State Museum. She holds Research Associate appointments at the New York State Museum and Mohonk Preserve and is an active participant and leader in the Northeast Partners in Amphibian and Reptile Conservation. She has a strong background in wildlife and aquatic biology research and management. 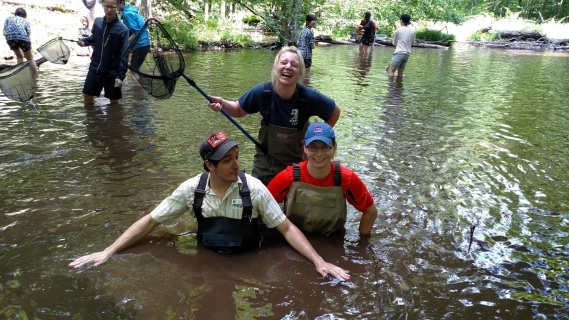 Her research interests focus on energy flow and the ecology of fishless waters, in particular examining the role of vernal pools in the conservation of pool-breeding amphibians in forested landscapes. George Robinson, Ph.D. is Associate Professor of Biological Sciences, University at Albany, SUNY. He holds appointments as Associate Scientist with the NY State Museum, as Visiting Scientist with NY State Parks, and is a member of the Scientific Working Group of the NY State Biodiversity Research Institute. Dr. Robinson is also certified at the rank of Senior Ecologist by the Ecological Society of America. He has supervised six graduate theses and dissertations based on research conducted at the Huyck Preserve, including studies of forest succession, tree disease, stream ecology, and invasive earthworm ecology. Supplemental lessons vary year-to-year but may include topics like science photography, illustration and writing, and ecological management and conservation. To apply online: apply online using our secure website via the link at the upper right of this page and pay by adding the item to your cart below. This item is for paying for one space for one student for the Wildlife Ecological Research Day summer program. Please indicate be sure to put the STUDENT's name in the box above!